The tower at St James, Colwall dates from the fourteenth century, but the earliest bell dates from 1778. At the beginning of the 20th century, peal ringing was popular at the tower and in 1923 the bell frame received major attention from Mears & Stainbank of Whitechapel, who had previously cast 2 new bells for Colwall in 1896. There has been a continuous history of ringing here since then. You can still see the Seages silent ringing apparatus in the ringing chamber, which allowed ringers in years gone by to practise without disturbing neighbours. 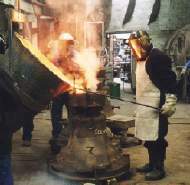 In 1997, the bells were rehung on a new frame and two new bells were cast at the Whitechapel foundry. Subsequently another type of silent ringing apparatus was installed to allow ringers to practise. Like the old Seages apparatus from years ago, this relies on a mechanical device to provide the experience of handling a bell. Unlike its older counterpart, it also incorporates an electronic sensor and a microprocessor to synthesise sound inside the tower and to provide a suitable learning environment. GIVEN BY DAVID AND CATHARINE FOX AND FAMILY S.D. P.S. C.M. C.H.